Some astronauts are taking the day off to celebrate Thanksgiving while they orbit Earth on the International Space Station. Add Thanksgiving as an interest to stay up to date on the latest Thanksgiving news, video, and analysis from ABC News. 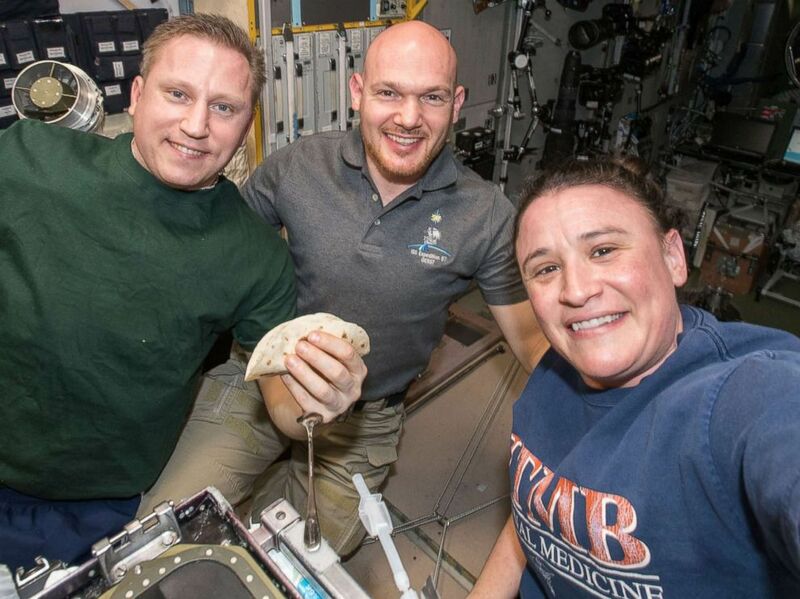 The three members of Expedition 57 from Russia, Germany and the U.S. will celebrate all together after food prepared specially for the occasion was sent to them last weekend, according to a NASA blogpost. Alexander Gerst from the European Space Agency and Serena Aunon Chancellor, a NASA flight engineer, will have the day off while their Russian colleague, Sergey Prokopyev, will join them for the feast after completing his normal work day. Flight Engineer Serena Aunon-Chancellor takes a group-selfie with Expedition 57 crewmates aboard the International Space Station, flight engineer Sergey Prokopyev and Alexander Gerst, in a photo shared on Nov. 9, 2018. A video posted to Twitter by the International Space Station shows Chancellor and Gerst talking about their packaged Thanksgiving supplies, which include turkey, stuffing and spicy pound cake. "Thanksgiving is a time to spend with those whom you love, whomever that might be. And so we'll be enjoying this meal together but then also calling our loved ones back on planet Earth,” Serena Aunon Chancellor said in the video posted on Wednesday. “From the crew of Expedition 57, from our home to yours, we wish you a very Happy Thanksgiving."